Berkeley Decides To Try Taxing Away Its Soda Habit : Shots - Health News Many cities and states have tried, but Berkeley, Calif., is the first to pass a penny-per-ounce tax on sugar-sweetened beverages. The goal is to reduce sugar consumption to improve public health. The majority of voters in San Francisco and Berkeley, Calif., voted in favor of a soda tax, but the measure didn't gain the required two-thirds majority required in San Francisco. 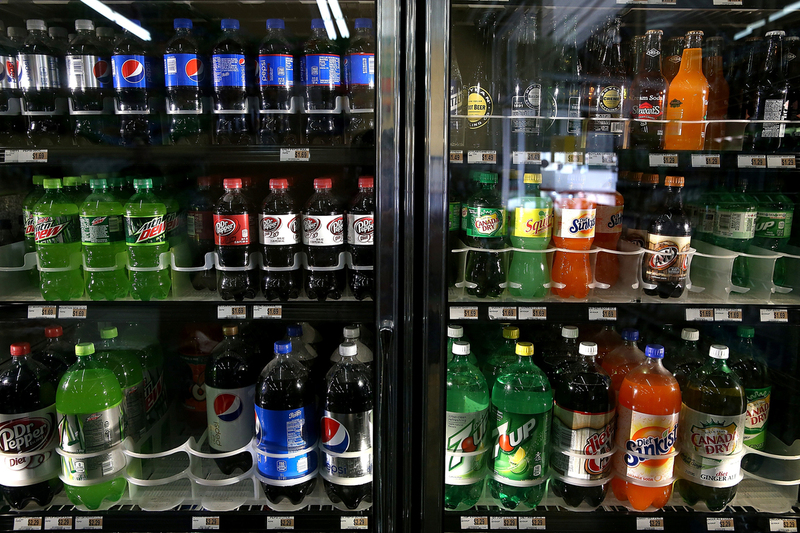 Voters in Berkeley, Calif., have passed the nation's first soda tax with a resounding 75 percent of the vote. The measure aimed to reduce the effects of sugar consumption on health, especially in increased rates of obesity and diabetes. More than 30 cities and states across the country have attempted such a tax, but have failed, at least in part because of big spending by the soda industry to defeat these measures. Across the bay in San Francisco, however, a similar proposal failed to get the two-thirds supermajority it needed. Berkeley's Measure D needed only a simple majority to pass. It will levy a penny-per-ounce tax on most sugar-sweetened beverages and is estimated to raise more than $1 million per year. Proceeds will go to the general fund; Measure D calls for the creation of a health panel to advise Berkeley's City Council on appropriate health programs to receive funding. Campaign co-chair Josh Daniels called Berkeley's win a tipping point. "I think you will now see many, many other cities and communities around the country looking at this as a genuine public policy to address the diabetes and obesity crisis that we face," he said. While the San Francisco proposition did not pass, supporters there declared a victory of their own: more than half the voters approved the tax despite millions spent by the American Beverage Association to defeat it. "So the fact that we were able to overcome $10 million," said Proposition E coauthor Scott Wiener, a member of the San Francisco Board of Supervisors, "and it looks like a majority of San Franciscans — despite that $10 million — will vote 'yes,' is pretty extraordinary." Roger Salazar, a spokesman for both opposition campaigns, funded primarily by the beverage association, called Berkeley "an anomaly" and said that to expect to pass such a tax elsewhere in California was "foolhardy." Advocates are convinced he's wrong. Harold Goldstein, executive director of the California Center for Public Health Advocacy, called the measure's passage "remarkable." "What we learned here in Berkeley," he said, "is that when voters learn the truth about sugary beverages, when they learn that they are one of the central causes of the growing diabetes epidemic, they want to tax it, they want to regulate these products." Indeed, sugar sweetened beverages are the primary source of added sugar in the American diet and that added sugar is linked to increasing rates of diabetes. Berkeley has a history of being first to a new cause that's later embraced more broadly, said Lori Dorfman, executive director for the Berkeley Media Studies Group. She noted that Berkeley was the first city to pass a clean indoor air ordinance. "In the mid-70s, Berkeley made the first 'curb cut,' and now people in wheelchairs all over the country are not trapped in their homes any more." Mexico enacted a soda tax earlier on January 1, and by summer, consumption had dropped 10 percent. Update 1:55 pm: Kelly Brownell, dean of Duke University's school of public policy first proposed a soda tax in the early 1990s. He called the votes in both Berkeley and San Francisco "historic" and, like other advocates, predicted other cities will soon follow suit. "My guess is that inside their boardrooms, they know very well these taxes are the beginning of the future," he said. "This is a wave starting to crest." Brownell said that half the costs of diabetes and obesity are born by taxpayers, through the government health insurance programs Medicare and Medicaid. Those public costs "justify the government getting involved, just like tobacco taxes," he said. This story is part of partnership that includes NPR, KQED, and the Kaiser Family Foundation.